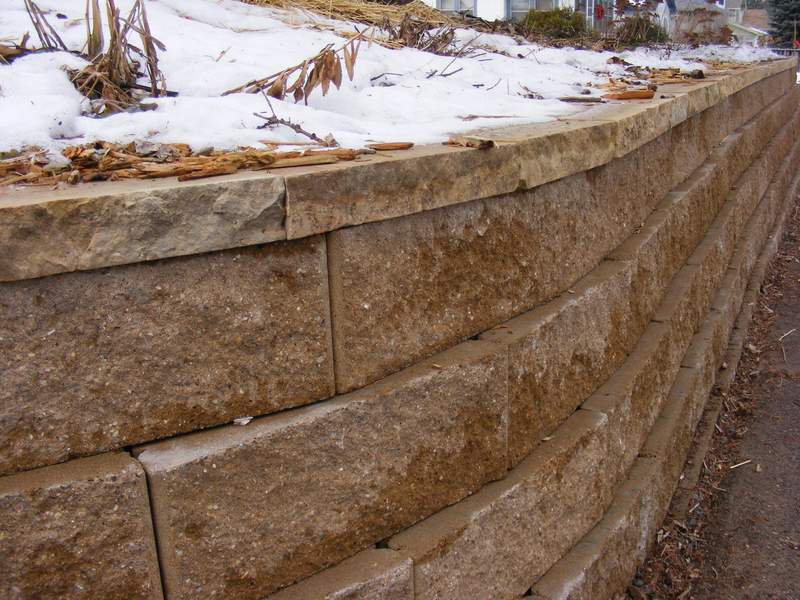 We left our retaining wall uncapped while we decided what kind of capstone to use. We’d discussed all the capstone options that you can buy at the home improvement stores, and they had all been found wanting. These were some of the capstone options we were playing with. Then, we were given two truck loads of stone. That ended the debate. Most people who know Stacey know that they can send any old, unwanted building materials in her direction. So it was with this four hundred and fifty million year old Kasota limestone. 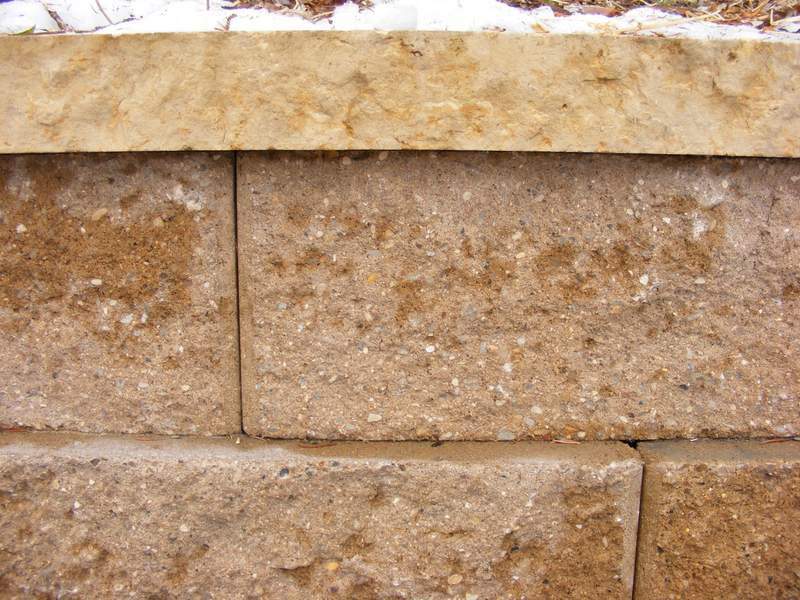 The limestone blocks were different sizes between 12″ and 36″ long. They were about 8″ wide, and thickness varied from 2½” to 3½”. We went and collected the stone without having a specific project in mind for it. We just knew it was nice-looking rock for some, as yet, undetermined project. Then it occurred to us that the rock would be ideal for capstones. The first thing to do was sort the stone into two piles based on thickness. 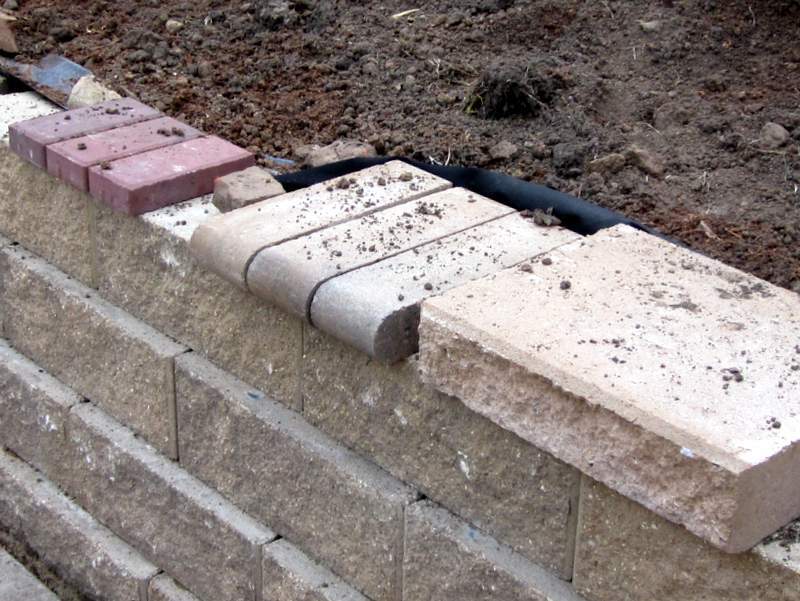 We decided to use the 2½” thick blocks for the wall top, because there were more of those than there were the 3½” thick ones. The thicker ones still have to be assigned to a project. The best idea so far is to create a minature Stone Henge in our front yard. 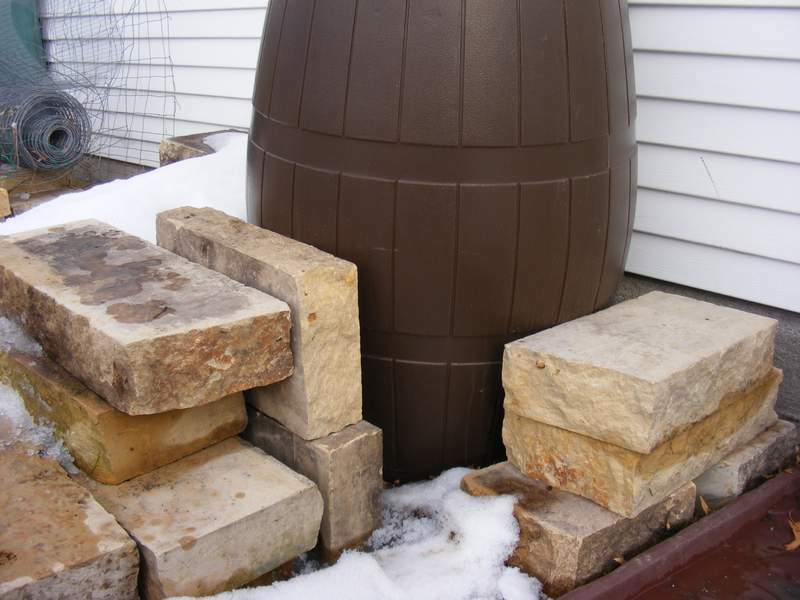 At the moment some of the thicker limestone blocks are preventing an empty rainwater barrel from being blown away. The longer limestone blocks were used to cap the straight parts of the wall, and the shorter ones were used at the corners. The ends of most of the blocks had been cut square across with a saw, so fitting the straight runs together was easy. At the corners, I cut the blocks at an angle so that they would fit together snugly. Most of the recommendations for cutting stone involve tapping away with a chisel. But I wanted straighter, cleaner edges than you get with a chisel. Ideally, I would have used a masonry saw, like this one shown in Masonry Magazine. This saw is ideal for cutting concrete blocks and stone. But I don’t have one of those. All I have is a 4½” angle grinder. My angle grinder was actually pretty effective at making nice cuts. I put a mark all the way around the block where I wanted to cut. Then, using a diamond tipped blade, I cut as deeply as possible on all four sides. Hammering a chisel into the cut separated the two halves. The finished retaining wall with the capstone in place. I was pretty happy with the result. The only thing to bear in mind, if you try it, is that there will be dust. So, wear a face mask, and try not envelope anyone else in your cloud. This entry was posted in Construction, Outdoor Building Projects, Yard & Garden and tagged yard. Bookmark the permalink.